Meet the entrepreneur who is always looking for the next challenge. 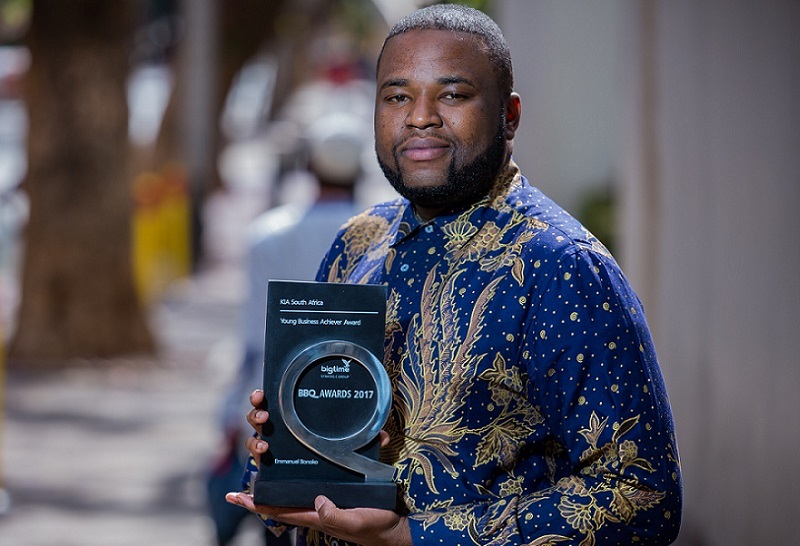 South Africa based Emmanuel Bonoko talks about setting up his agency and what excites him about entrepreneurship and the PR and marketing space. He shares with The East African Business Times the story behind his company, and offers advice on how entrepreneurs can be the simple stylists of their successful businesses. Before we get into PR and Marketing Agency space as a whole, you are one of the founding partners of EBonoko Holdings. Can you give us a quick potted history of the company, from your perspective? How it came to be, the principles on which it was founded? When I was 20 years, I founded the EBonoko Foundation with the aim of serving others and fostering leadership, youth empowerment and entrepreneurship. One of our main initiatives is a book drive that saw over 16 000 books collected over the years and donated to under-resourced schools, charities, libraries, prisons and community centers. This led to other successful projects, including youth mentorship programmes, bursary campaigns, career expos and seminar workshops focusing on business and leadership. It was during this time that I was able to build networks and I got so much exposure throughout the world and set up my business. Today, Ebonoko Holdings PTY LTD is a marketing and consulting company with multiple services which include; Media relations, PR Management, Design and Brand Development, Brand Strategy, Promotions and Marketing, Events hosting and Management as well as digital marketing. What are three biggest challenges and biggest difficulties faced in terms of starting a Business? I did not have an easy go in business, but I always had the support of my parents. My mother, in particular, had a significant impact on me, I learnt a lot about what it takes to come through on the other side. But one of the things I learnt was to never to be afraid or embarrassed to struggle. There is absolutely no shame in working hard to get to where you want to be. No shame at all. What was the PR and Marketing Agency events space like five years ago, what are the biggest changes you’ve seen in that time? The Business world at large keeps taking different shapes and undergoes reinvention. There are many Marketing Agencies in Africa. Most corporates are now looking for collaborations and joint strategy to have more impact in the market through their service offering. If you conduct Media Campaigns /PR management projects now, you are required to understand the markets, make sure you understand the shift in the market and understand how your clients are moving and adapting with the ever-changing times. Finally we are also seeing technology taking over and affecting most businesses globally. How we used to market or communicate brands to relevant clients is different now and social media is also a big deal globally. What does it take to become a successful Business Leader in The Marketing and PR space? Does this profession demand specific characteristics or is just about how creatively one approaches event projects? Please state five strong personal characteristics that characterize a good event planner. There are a several characteristics I believe are important. First, the Power of networking which helps people grow their businesses. Secondly having a Global vision for our business has propelled us to grow significantly well over the years. Third is having discipline, character and branding which are key for growth. Above all, you need to have faith in GOD. My mentor, Phuti Mahanyele is the former CEO of Shanduka Group, a multi-billion rand diversified African investment holding company. She taught me that Business is 80 per cent spiritually and 20 per cent hard work. What are the biggest risks and challenges a company can face when executing a critical Marketing and PR agency campaign, particularly in regards to finance? Something we have done well over the years, is to have mentors that believed in our vision and we did so many collaborations with a number of companies to get experience and exposure. My advice would be to ensure that you use every opportunity you have as an entrepreneur to grow your brand and business. All you need to do is find your voice through your work and build a reputable brand that is trusted with consistency. Never be afraid or embarrassed to struggle. There is absolutely no shame in working hard to get to where you want to be. Also, learn to invest in yourself as an entrepreneur build relationships and increase your business acumen. Finally, collaborations is key amongst ourselves as entrepreneurs. About the future? Where do you see your company in the next five to 10 years? As one of the fastest growing Marketing and PR agencies in South Africa, we are planning to partner and collaborate with other African Marketing Agencies especially in East Africa. I want to create more jobs for young people across Africa and be known for the impact we are making through our companies. Above all I want to be known as someone who pursued his dreams and goals against all odds to give young people a voice to follow their dreams and goals. What’s the most inspiring Marketing and PR Campaign event you’ve been involved with? Over the years we partnered and serviced some of the biggest corporates in South Africa from: Eskom Foundation, Shanduka Investment group, Shell South Africa, Mogale city Municipality, Standard Bank, PBT Group, IDC and many more. In 2018, we conducted PR campaigns for one of the biggest banks in South Africa, Nedbank. We did their brand development strategy through media profiling, social media content and their events Concept and arranged expert speakers. We also hosted some of the biggest events in South Africa with quality and exception, which we impacted lives through enterprise development and educational forums.